Okay okay, maybe it wasn’t spring rolls that were getting jiggy wit it in their heads. I knoooow. It’s two days before Christmas and all I’m giving you is SPRING ROLLS?!?!? Yep yep yippee. EASY –> Easy ingredients. Easy to prep. Easy to make. Easy starting point for your New Years foodie resolutions. Just hit the Easy button already. FAST –> Which basically goes along with easy. 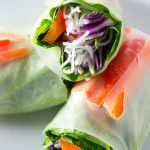 These salad springs rolls can be made in 5 minutes flat. Even if you don’t have all your ingredients pre-prepped they are still crazy quick to make. Crazy like the holiday shopper that is waiting until the last day to do their shopping. You brave last minute shopper you. 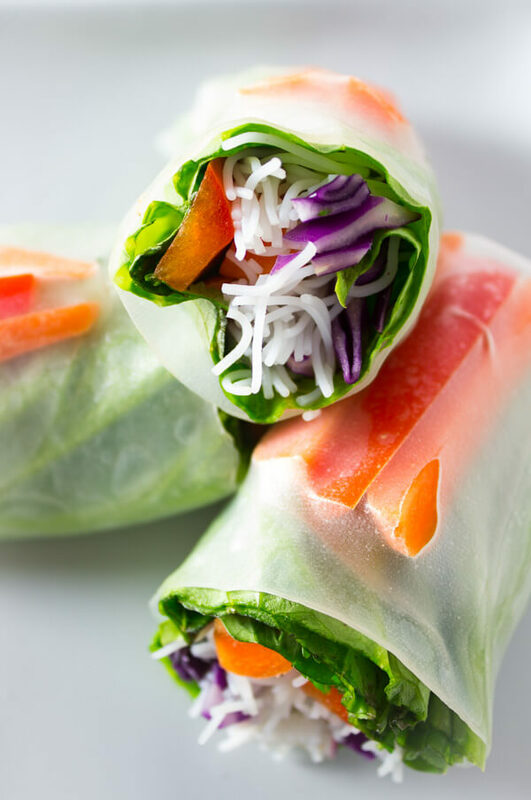 Take some of these vegan salad spring rolls with you. Wrap them up in some plastic wrap, stuff ’em in your purse or man bag and fly like the reindeer before the stores close up. You’ve got this. Especially with this quick, nutritious snack as your backup. I probably don’t even need to point this last one out but just in case you forgot. 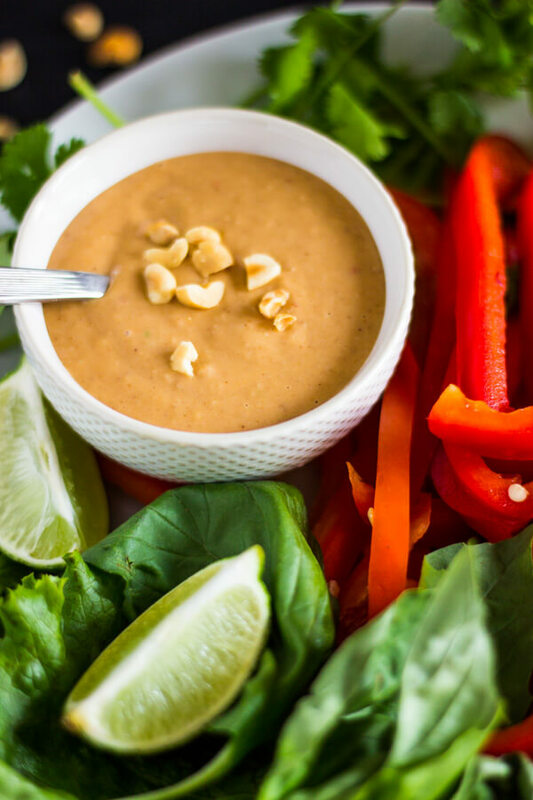 PEANUT SAUCE. I knew you didn’t forget it. 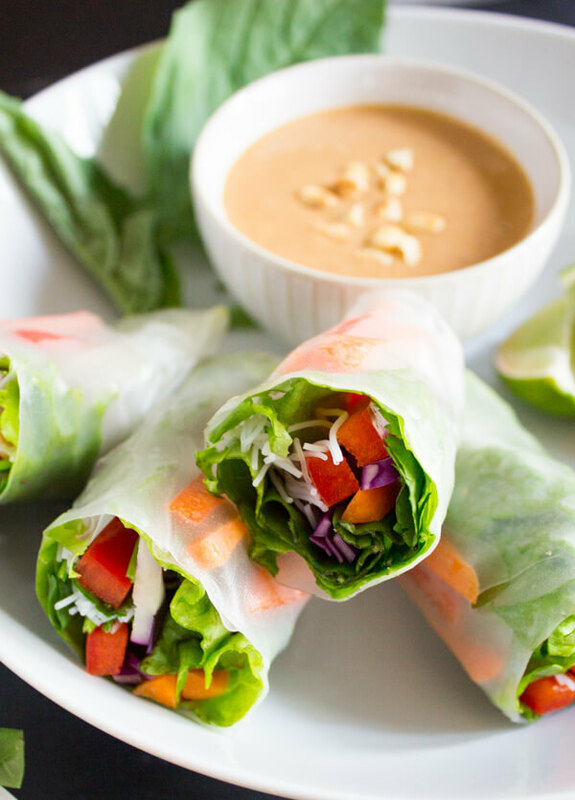 Peanut Sauce + Spring Rolls = vegetable dipping bliss. Still contemplating the peanut sauce chapstick. Whaddyathink?!? 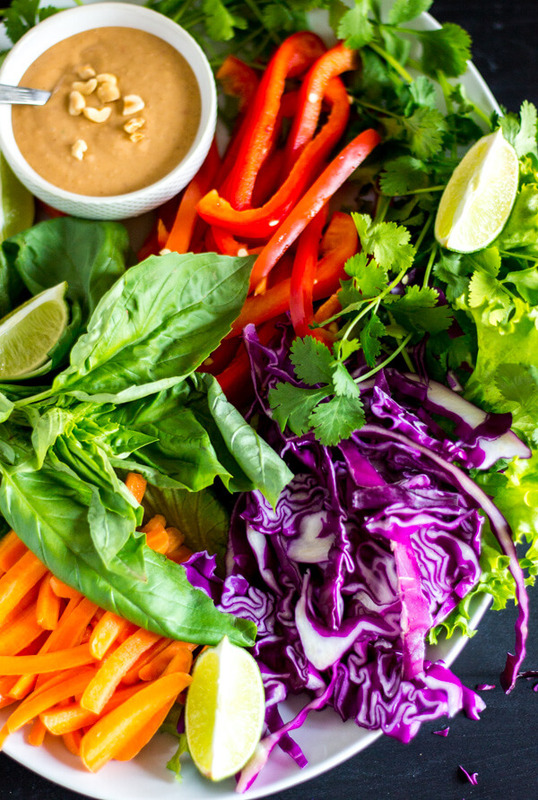 Set up a veggie buffet with lettuce, red cabbage, red bell peppers, carrots, cilantro, fresh basil, and rice vermicelli noodles and have a spring roll wrapping party with your fam. Feel free to get wild with your spring rolls. I’m just giving you a starting point. Add any veggies you fancy or even some tofu. Want some meat? Add it in! Chicken, shrimp, or steak all work. 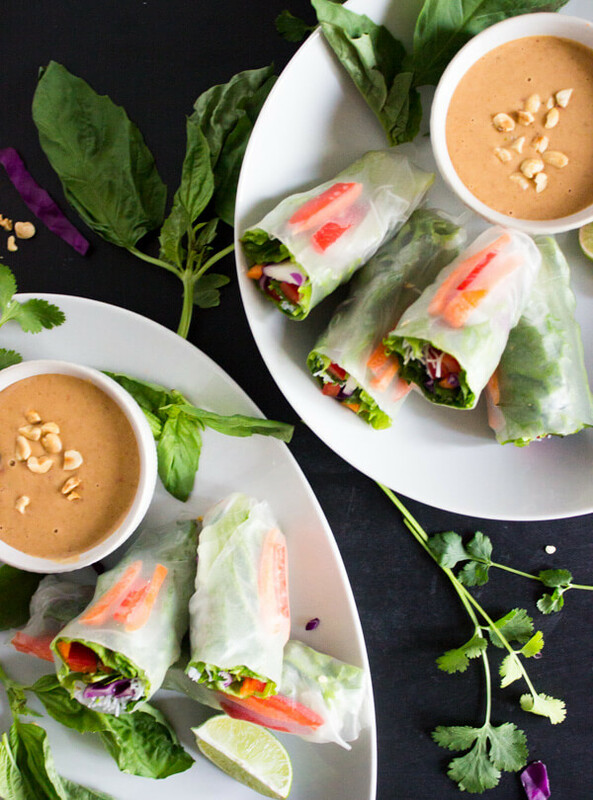 And it’s with these vegan salad spring rolls with peanut sauce that I’m wrapping up 2016! A first year of blogging that is summed up with 27 recipes that I hope you have enjoyed and shared with the ones you love. Thank you for joining me in my debut year whether it was by posting a comment on this blog, hanging out with me on Instagram, Facebook, Pinterest, or Twitter, or by some you even telling me in person that you made a recipe and it’s become one of your go-to’s. I have truly loved hearing from you and having you join me in the journey of food and life. May you have an absolutely fantastic Christmas full of merriment and joy! Yummy, Shannon! I’ve NEVER even bought rice paper, but your blog inspired me to do so and I just made myself some rolls for a late night snack. I’m now making the peanut sauce and I’m sure it’s going to be just as yummy! Thanks! My Vegan Spring Rolls came out fantastic, and the peanut sauce is the bomb!!! Thank you!!!!!! Hi Shannon, I just stumbled across your website and can’t wait to try these with your peanut sauce! Normally I’m not one for commenting on recipes (I know, I know, I make food bloggers sad), but seeing how your recipes and photography look so amazing, and that you’re also in Portland, I had to! Now I won’t have to go to the food carts downtown to get my Spring Roll fix! Thanks so much for taking the time to share this awesome recipe! Aaah Kati, you just totally made my day! Thanks for your sweet comment and I feel especially honored since you don’t normally comment on food blogs. ???? I hope these spring rolls and the peanut sauce just knock your socks off because I hear ya on those food carts. Those carts turn out some crazy good food! Love this and love your variation of The Night Before Christmas! These look so fresh and simple! I love these! Crunchy, fresh, holiday snack alternative. Nice!